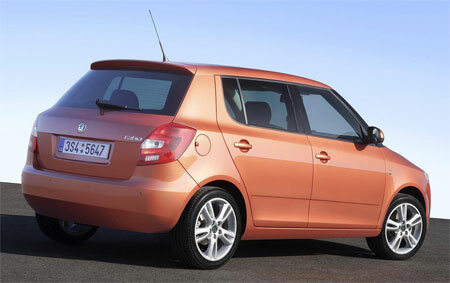 Skoda has unveiled a major update to it’s smart supermini, the Skoda Fabia. The new Skoda Fabia carries Skoda’s new front facia look as shown on the new Skoda Roomster, and from what I can see, there’s also some Suzuki Swift-like design elements in the side profile design. Thanks to the new front bumper, it is a little longer than the previous Fabia (read review here). External measurements of 3992 mm x 1642 mm x 1498 mm make it one of the largest superminis in it’s class. The boot has a basic capacity of 300 litres, up to 1163 litres when the rear seats are folded down. 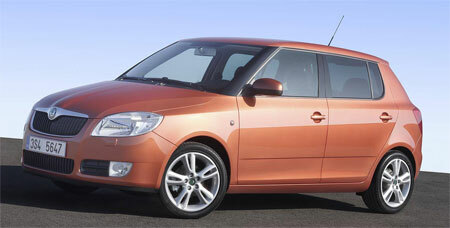 The new Skoda Fabia comes with 4 petrol engine options as well as 3 diesel engine options. Petrol engines include a 60 horsepower 1.2 litre, a 68 horsepower 1.2 litre, a 84 horsepower 1.4 litre 16 valve, and finally a 1.6 litre 16 valve making 103 horsepower. The oil burners include a 1.4 litre turbodiesel making 68 horsepower, a higher output 79 horsepower 1.4 litre turbodiesel with diesel particulate filter, and a 103 horsepower 1.9 litre turbodiesel also with diesel particulate filter. All engine options come with 5-speed manual transmissions, and the 1.6 litre petrol option can also be equipped with a 6-speed Tiptronic automatic transmission. New safety features include head airbags for both front and rear seats. In the rear, a childs seat can be affixed with a top-tether belt which limits the forward movement of the upper part of the childs seat in the event of a head-on collision.